Hello, hookers! I posted a while ago about my Collaborative Leadership Project. I just want to give a quick update on the progress I’m making with it! 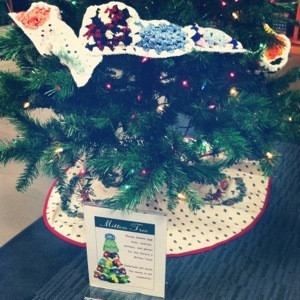 I have started sitting in with the crochet group at my library and they seem to be excited about the project. A few members have learned to work in the round and have expressed interest in making some squares as soon as they get it down pat, which is great! I’ve also received a small number of squares from some of my co-workers at the library and even some friends who crochet, so a huge THANK YOU to everyone who has helped and who plans to help out! You may or may not know, but I am in Grad School for Library Science. One of the classes I’m in this semester is a leadership course where, surprise, we learn how to be successful leaders. Throughout the semester, each of us has to come up with and present a Collaborative Leadership Project. I’m not entirely sure if we’re required to actually follow through with the project, but I feel like my “do good” meter is running low so I actually want to follow through on my plan. I knew from the start I wanted to incorporate my hobby of crocheting and use the resources available to me (my blog, colleagues at the library, and the crocheting community) to do some good. So as I said, I’m calling out to my fellow crochet hookers! I’ll list the requirements below and the mailing info. Please help me out with this. Granny squares are so simple and even if you only have time to make a few, it will still be a big help! Use medium weight, 100% acrylic, machine washable yarn. If you can’t use this yarn, that’s okay too. Like-squares will be joined together. Feel free to use any color(s) you want! The more color the better. Make them solid, or use multiple colors in one square. Only do four rounds, as the fifth will be the joining round. Use a 5mm/H gauge hook. 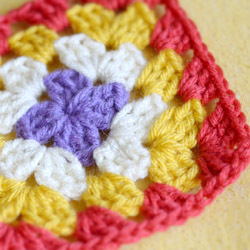 If you don’t know how to make granny squares, don’t fret! I’ve found some really helpful patterns and step-by-step instructions from some awesome blogs. So go check those out for some ideas. Thank you so much in advance to everyone who participates. If you’d like to enclose a little card or something I’ll include that in my package when I drop off the scarves. Otherwise I’ll include your name (unless you’d like to remain anonymous) in a note. Please pass this along to anyone it wouldn’t otherwise reach and let’s see how many squares can warm the hearts and souls of these women.